Arthur Christopher Orme Plummer CC (born December 13, 1929) is a Canadian stage, voice, television and movie actor. His first role was in the 1958 movie Stage Struck. He is known for his roles in The Sound of Music, The Night of the Generals, The Return of the Pink Panther and The Man Who Would be King. Plummer won an Academy Award for his performance in Beginners. For his performance in All the Money in the World, Plummer was nominated for the award for Best Supporting Actor, becoming the oldest person to be nominated for the Academy Award. Plummer was born in Toronto. His parents were Isabella Mary (née Abbott) and John Orme Plummer. Plummer's great grandfather is Canadian prime minister John Abbott. He is the grandson of John Bethune. Plummer studied at the Canadian Repertory Theatre. Plummer started acting in 1953. 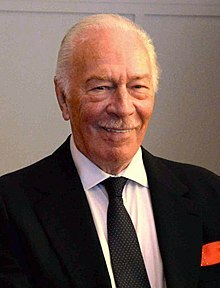 He played Captain von Trapp in the 1965 movie The Sound of Music. Plummer played Mike Wallace in the movie The Insider. He played Charles Muntz in Up. He played 1 in 9. He played Leo Tolstoy in The Last Station. He played Doctor Parnassus in The Imaginarium of Doctor Parnassus. He played Henrik Vanger in The Girl with the Dragon Tattoo. He played Hal in Beginners. His role as Hal led his to his Academy Award win. In 2017, Plummer replaced Kevin Spacey and played J. Paul Getty in the movie All the Money in the World. Plummer has won many awards for his roles. They include an Academy Award, two Emmy Awards, two Tony Awards, a Golden Globe Award, a Drama Desk Award, a SAG Award, and a BAFTA Award. With his win of an Academy Award for his role as Hal in Beginners, Plummer is the oldest actor to win an Academy Award. Plummer married Tammy Grimes from 1956 to 1960. They had a daughter, Amanda. He married Patricia Lewis from 1962 to 1967. He married Elaine Taylor in 1970. ↑ Witchel, Alex (19 November 2008). "Christopher Plummer's legendary life, wonderfully retold". The New York Times. NYTimes.com. Retrieved 2012-07-25. ↑ "Christopher Plummer overview". MSN.com. Retrieved October 5, 2014. ↑ "Awards for Christopher Plummer". Internet Movie Database. Retrieved July 25, 2012. This page was last changed on 7 April 2019, at 18:30.